A vintage-style canvas printed thangka of Dharma Protector Setrap, the wrathful emanation of Buddha Amitabha. His holy energy grants protection from black magic and the unseen, brings swift assistance for life's daily challenges and helps overcome inner obstacles such as anger, attachment, ignorance and a self-cherishing attitude. 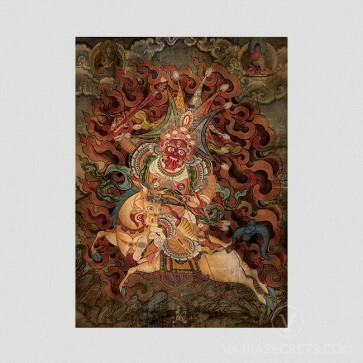 A vintage-style canvas printed thangka of Dharma Protector Setrap, perfect for those seeking a unique interpretation of Setrap's imagery. This is a reproduction of a holy Setrap thangka that belongs to H.E. Tsem Rinpoche, which has shown miraculous signs in the past. At the left top corner sits Lama Tsongkhapa, the great 14th century Tibetan scholar and saint. The Buddha of Infinite Light, Amitabha sits at the top right corner in a meditative pose with a begging bowl. Wrathful emanation of Buddha Amitabha, Dharmapala or Dharma Protector Setrap is an ancient protector who comes from the Holy Land of Bodhgaya, and whose role is to protect the teachings of Buddhism and Buddhist practitioners. Setrap comes swiftly to our rescue when we face outer and inner obstacles in our daily lives and spiritual paths. Motivated by compassion and loving care for all sentient beings, Setrap's fierce demeanour is similar to that of an angry parent towards their wayward children hoping to wake them to their senses, and stop them from harming themselves. His holy energy grants protection from black magic and the unseen, brings swift assistance for life's daily challenges and helps overcome inner obstacles such as anger, attachment, ignorance and a self-cherishing attitude. Having an image of him close to us or in our homes bestows immense blessings and protection on our surroundings and ourselves.